I am no stranger to talking about my guilty pleasures on this blog so it should come as no surprise to anyone for me to announce that I LOVE MUSICALS. Some of my fondest memories as a kid are watching and singing along with The Sound of Music (and Mary Poppins and Bedknobs & Broomsticks & The Wiz, et al.) with my mom. To this day, I still think Julie Andrews is the Queen Bee. When I got older, I joined choir and I even dabbled a bit in musical theater (chorus member in high school productions of Fiddler on the Roof and Fame, here) and even got a lead role as Lucy in You're A Good Man Charlie Brown in a community theater production. But by the time I was a sophomore in high school, my interests had shifted from performing to writing so I haven't danced or sang for an audience since (outside of karaoke). Despite my lack of performing within the last 12 (!) years, musicals still hold a soft spot in my heart. While I am not a big fan of say, Glee (although I can see myself being really into it if it had debuted when I was 14), when I saw the preview to NBC's Smash after last spring's upfronts to say that I was immediately hooked from the first few notes of Christina Aguilera's "Beautiful" would be an understatement. I knew that this was a guilty pleasure show right up there with True Blood (which thankfully comes back next month) for me, regardless of how bad it turned out... which as it turns out, can be pretty bad sometimes a lot of the time. So maybe Katherine McPhee isn't a good actress and it isn't always believable or even entirely coherent or but when Smash is good, it's really good, which is almost entirely thanks to the original music. The songs are so well-written that I would actually pay to see "Bombshell" (the show within the show based on the life of Marilyn Monroe, for the uninitiated) if it were real. I may or may not have caught myself listening to some of the songs during a Spotify private listening sessions, that's all I'm saying. But regardless of my feelings about the show, what I really wanted to write about was Karen Cartwright's (Katherine McPhee) dreamy boyfriend black handbag with gold studs that I've been lusting after for the past few episodes. Apparently, I'm not the only one because the first result for my Google search of "karen cartwright purse handbag" came up with a link to the blog Justified Obsession, who tracked it down. The brand is ROMYGOLD and the Drew Stud Hobo costs $495. 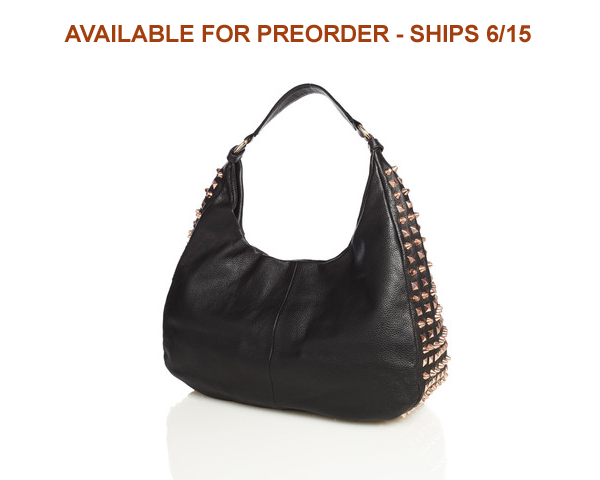 Karen's version is black with rose gold studs but it comes in a few other color combinations. But really, Smash? Struggling up and coming performer, $200-a-week-workshop-salary Karen can splurge on a $500 bag? Or was it a gift from her dreamy successful boyfriend or the movie star, Rebecca Duvall? I had at least an inkling of hope it might be the kind of bag that I a girl like Karen could pick up at Macy's or JC Penney or Forever 21, you know, somewhere where poors shop. Way to dash my dreams, television. Truly nothing in the entertainment industry is what is seems. Anyway, Smash just wrapped up for the season so now most shows are going on summer hiatus, you can probably catch up on Hulu or NBC.com, if you're so inclined. And what the hell, this post also gives me an excuse to post a picture of Raza Jaffery, who plays Karen's boyfriend, Dev, on the show. I forgive him for that embarrassing Bollywood number because he looks really good a suit.